Let the СО2 trading start now! Contrary to the expectations, young people, aged between 15 and 24 years are less interested in climate change although they are going to be the main victims. This is the result of an opinion poll the European Commission ordered and which led to organising a campaign with the help of the MTV that will cover 11 countries, among which Bulgaria. The idea is an increase of awareness what risks climate change pose and what each individual can do to avert it. The start of the campaign will be on the 20th of August in Stockholm with a concert of the American pop star Moby. There will be also concerts in Budapest and Copenhagen. However, it is more than clear that organising concerts will not solve the problem nor individual actions will. Much more is necessary than we can afford. And since the USA started a mini revolution by introducing an entirely new cap and trade legislation it met with fierce opposition from business and politicians from different colours. In Great Britain something very similar happened as well. On Wednesday the British government introduced the first of its kind Renewable Energy Strategy but the critics of the document proved to be too many. They offer arguments that manage to get under the skin of almost everyone - job losses, too high a price and slow return of investments, higher electricity bills. But the strategy has supporters as well who criticize the fact that the country that gave birth to the Industrial revolution some 200 years ago is lagging behind in using renewable sources of energy which the UK has at disposal - tidal waves, strong winds, solar energy - a great abundance of them on the island. 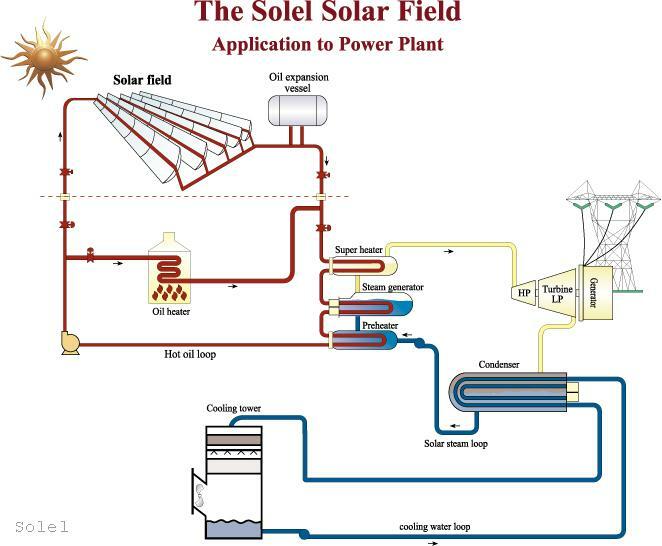 The aim of the project is the Sahara desert, as well as some desert regions in the Middle East to be used for building solar thermal power plants which are not solar installations but a system of thousands of mirrors that focus the sun's rays on to a receiver containing a heat transfer fluid, such as oil. 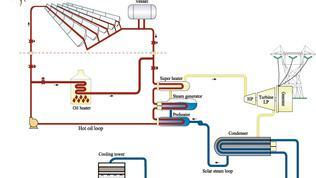 This heat energy is used to produce steam that drives a turbine, much like in a traditional power station. With high-voltage direct current (HVDC) transmission cables under the Mediterranean sea, the founders of the Desertec Industrial Initiative hope one day to supply 15 per cent of Europe's electricity needs. The initiators of the idea have come to realise that the problem is much more complex than just climate change. In fact the picture is much grimmer: given the population growth which is far beyond Earth's capacity to feed and carry us, as well as climate change which become more and more tangible and just few years ago climate change seemed something far in the future. This is all to show that by 2050 we will need 3 Earths to satisfy our growing needs of food, water and energy. is already larger than the Earth can sustain. The average temperature rise in the atmosphere, the melting of the polar ice caps as well as the increase in extreme weather events (fast alternation of floods and droughts) worldwide are obvious signs that we are putting too great a strain on the Earth. 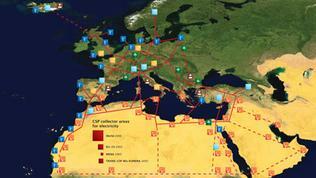 Studies by the German Aerospace Center (DLR) show that, within 40 years, solar thermal power plants in particular will be capable of generating economically more than half of the electricity needs of the EUMENA region (Europe, the Middle East, North Africa) at that time. 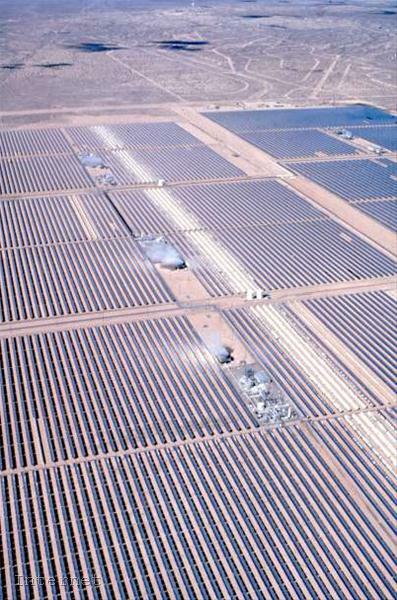 In order to meet today‘s global power demand of 18,000 TWh/year, it would suffice to equip about about 90,000 km2 of the world‘s deserts with solar collectors of solar thermal power plants. About 20 m2 of desert would be enough to meet the individual power demand of one human being day and night - all this absolutely CO2 free. This is possible because within 6 hours deserts receive more energy from the sun than humankind consumes within a year! The number of deserts on Earth is fully enough to satisfy more than 90% of world's population with clean energy. Furthermore, unless urgent measures are taken, the number of deserts might increase. And given the political will, it would be possible to achieve a worldwide realisation of the DESERTEC Concept in less than 30 years. 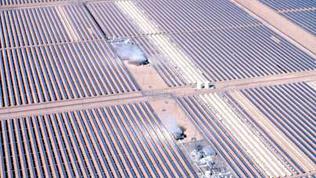 Besides, the initiators of the project believe that this project might help creating a lot more jobs because someone will have to produce the components for the solar thermal power plants and they will be a lot. Otherwise, the price is dear - between 10 and 20 euro cents KWh depending on location and technology. But here the price of taking care of the environment is also included unlike the current prices for production of energy from fossil fuels, like coal for example. Probably, these lines seem like a scientific theory to you which cannot be realised in near future. The truth is that the concept has the political support of the German chancellor Angela Merkel and the president of the European Commission Jose Manuel Barroso. Furthermore, as the spokesman of the Energy Commissioner Ferran Tarradellas explained, the necessary regulatory framework has already been prepared for this project. The European funds will also be used to finance it. Because the rest of the facts speak for themselves: G8 agreed to diminish the production of carbon dioxide by 50% bu 2050 instead of the initial goal of 80%. And the EU agreed more than a year ago the scheme 20-20-20 or decrease of greenhouse emissions by 20% by 2020, decrease in energy consumption by 20% through increasing energy efficiency and 20% of the consumed energy to be from renewable sources. Asked by euinside whether the achievements of the G8 summit in L'Acquila will lead to a change in this scheme, Mr. Ferran Tarradellas explained that it is possible that if a global agreement is reached the EU might increase the scheme to 30%. And a global agreement is expected to be reached on the UN climate change conference in Copenhagen which starts on the 7th of December. And by then we will see if there will be more countries that will introduce revolutionary legislation like the US and the UK. I t would also be very interesting to see to what extent the new Bulgarian government is interested in green issues. I hope this project will be separated in modules, otherwise it would fail like a giant elephant trying to stand on one foot.